The calendars are spotty at times but I have at least 463 shows on record with these guys. Some of my oldest friends and the band I got my start with. Basically some high school friends I jumped into a van with right after high school. We toured quite a lot in the early 1990’s. Booking our own shows and trading shows with bands from all over the Mid-West and the South. We’d bring them to Columbus for a show and they would have us to their town for a show. That’s how indie-bands survived back then. We did gigs all over the South, Midwest and East Coast. Any city within a 12 hour drive of Columbus was fair game. It was with these guys I got my road legs and learned how to fix smashed guitars and live on $15/day, often times less than that. Obviously I wasn’t making money, it was more a cost/benefit ratio for me. I could go out for three, five, 12 days at a time with these guys or however many gigs we could string together and make maybe $75 over a five day weekend trip and all the free beer I wanted or I could stay in Columbus and easily blow $100 over that same period of time. In my early 20’s traveling with my friends was the easy answer. Opening slots for The Smithereens and Dash Rip Rock were my first dealings with “real” roadies. The guys with Dash Rip Rock were the first referral I got, for Concrete Blonde. I didn’t take the gig, it didn’t work out, can’t remember why, but I was amazed at the money they were offering. $400/week in ’93, I was 23, sure seemed like quite a lot. My first inking that I could actually make money in this racket. 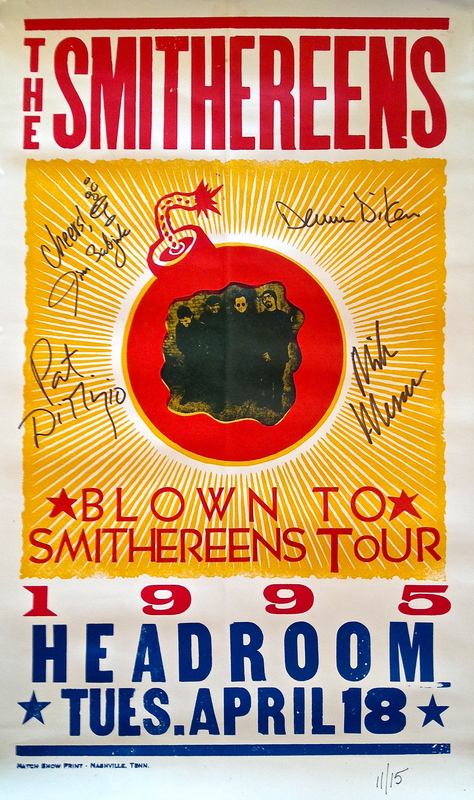 In 1995 we were opening for The Smithereens. Their Guitar Tech Kevin “Chopper” Wermeychik R.I.P was the first to take me under his wing and say “this is how ya’ do things kid”. He had been with them for close to 10 years all through their hey-day (tours with Semi-Trucks and separate busses for band and crew. Completely foreign to the five of us in a cargo van with the gear) I remember asking him if he thought I could do this “roadie” thing. His response was simple, ” You are aren’t you?”. He was also the first to tell me what it was going to be like if Watershed ever hit big. Eight, 12, 15 month tours. I thought to myself “Yea right, that’s how they did it in the ’70’s and ’80’s” Four years later I was deep in the grind Chopper was talking about, working for bands I used to listen to in the van. 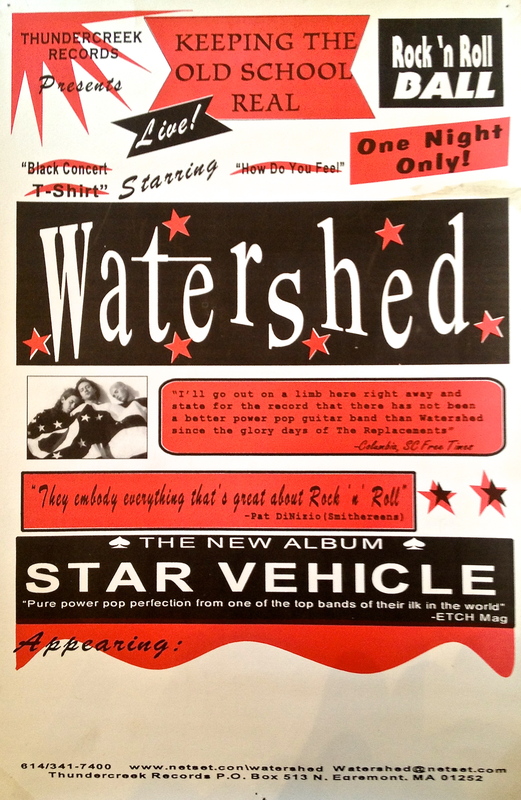 Watershed never got their day in the sun. At the time we all thought it was right around the corner, just one more break, one more good opening tour. The truth is we were never that close to “making it” and The Smithereens tour wasn’t that big of a tour to be on, Clearly on their last legs, their lead guitar player had a warehouse job and had to get time off to tour by telling the boss he was a roadie for The Smithereens, cruel irony. Both bands were dropped from their record deals in the last week of the tour. I’ve seen 100 opening acts in a van since then and almost all of them had more going for them than Watershed did. I’ve often wondered if they still think success was right around the corner, like we all did when we were kids. Watershed still draw big crowds in Columbus, but like many local bands around the country, they suffer from big-fish-in-a-small-pond-syndrome. Is that a blessing or a curse? Not for me to say. They continue to put out solid records although their touring days are few and far between anymore. They remain close friends of mine, after all I spent most of my early 20’s in a van with these guys. My first glimpse of touring, and the first time I got to California.